Choice is good, and today's new edition of Saturday Sharing lets you choose from an eclectic compilation of links for your browsing pleasure. ✦ The Poetry Foundation has now made accessible online every issue of Poetry magazine since 1912. The Archive is searchable by poet, poem, and keyword. This is a tremendous resource! ✦ The next time you think about tossing that plastic liter-bottle of soda in the recycling bin, consider what this family in Argentina did with theirs: They built La Casa de Botellas — The House of Bottles — entirely from common household cast-offs. The structure and all furnishings are crafted from plastic bottles, aluminum cans, Tetra Pax boxboard, and other recyclabes. The family's daughter enjoys as her playhouse a scale-downed version of the main house. ✦ Did you miss Earth Day 2011? It's never to late to Go Green. This Arts for the Earth campaign describes ongoing, achievable goals for museums and art venues and environment-based arts education for school and after-school programs. Some innovative activities you might want to incorporate in your plans for observing next year's Earth Day: Women and the Green Economy™ (WAGE) and The Canopy Project. ✦ This is for all my friends in New York City and for anyone else who likes what can be done with technology. Here are the details about Alexander Chen's Conductor. The visuals are based on Massimo Vignelli's 1972 diagram of the New York City Subway map. ✭ Former NASA employee, artist, and architect Kurt Wenner creates marvelous 3-D illusions on pavement, using a unique geometry he devised and perfected over several decades. Go here to see a 21-image slideshow that will leave you stunned and delighted. A gallery of his work, created all over the world, also may be downloaded here. Look for Wenner's new book Asphalt Renaissance: The Pavement Art and 3-D Illusions of Kurt Wenner (Sterling Signature), scheduled for release this August. More of Wenner's videos are found here and on YouTube. ✭ At Greymatters you'll find the arresting abstract expressionist paintings of Denver-based Karen Roehl and Carol Browning, and the "poured" paintings of multi-media artist Theresa Anderson. Each is enormously talented and deserves more than a casual look. 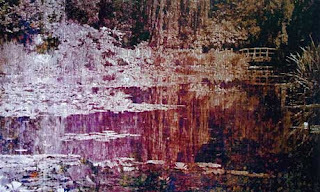 ✭ In McLean, Virginia, McLean Project for the Arts is presenting the work of three artists through June 4: "Trace of a Moving Point: Works by Fiona Ross", "Unseen Extracts, McLean: Photographs by Bill Prosser", and "Point of Origin: New Works by Kristin Reiber Harris". Fiona Ross, of Richmond, Virginia, produces stylized depictions of landscapes and figures through intricate line work. Bill Prosser, based in McLean, focuses his eye on landscapes and interiors; his black-and-white images are finely composed, often graphical in orientation. Inspired by nature, Kristin Reiber Harris creates large-scale, layered geometric drawings and woodcuts that reveal the influences of Buddhist and Islamic art and philosophy. Her woodcuts are especially lovely. Mixed Media on Paper, 43" x 52"
✭ In collaboration with the Bronx Museum of the Arts, the MIT List Visual Arts Center, Cambridge, Massachusetts, will be exhibiting "Juan Downey: The Invisible Architect", May 5 - July 12; the opening reception is May 4. The show is the first U.S. museum survey of Downey, who was born in Chile, educated in Chile and France, and lived for much of his career in New York City. He died in 1993. He was a fellow at MIT's Center for Advanced Visual Studies in 1973 and 1975, and received numerous other grants and awards. The show features foundational early work, including Downey's two major works Video Trans Americas and The Thinking Eye (El Ojo Pensante), a series produced for public television. Downey's work is found in museum collections around the world. An illustrated catalogue accompanies the exhibition, which will travel to Arizona State University Art Museum, Tempe, Arizona, in September, and to Bronx Museum of the Arts, New York, in February 2012. 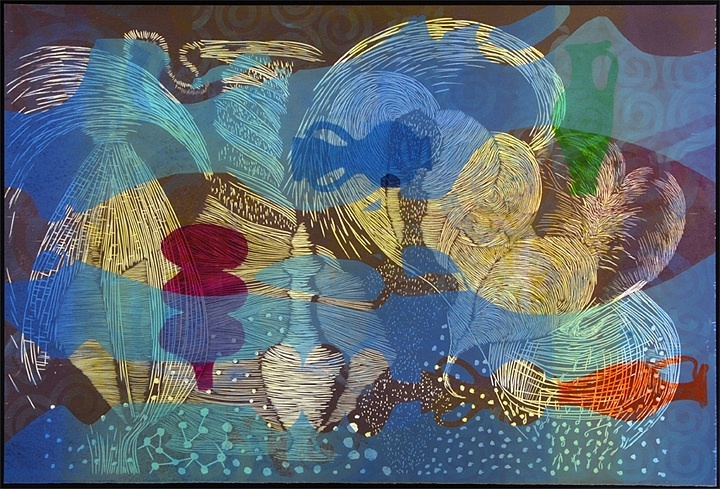 ✭ Washington, D.C.'s Old Print Gallery is showing through June 4 "Prima Materia: Vernal Matrix Woodcuts and Monotypes by Susan Goldman". In Homer, the Prima Materia is a metaphor for Earth's womb; in Goldman's prints, the metaphor is represented by the amphora (see image below). Gallery notes describe "a truly dynamic collection" that exhibits "a beautiful interplay of vibrant color and patterns derived from nature." Go here to see a selection of work from the show. Note the female silhouette in these wonderful layered prints. Take time to visit Goldman's site, where many more images of her very fine work may be viewed. the drifting and reading and gazing that poets do. . . .
With the April 6 announcement that contemporary poet James Richardson had won the $50,000 Jackson Poetry Prize, bestowed by Poets & Writers on an American poet of "exceptional talent who deserves wider recognition", I did a bit of research to uncover a few of Richardson's poems and to learn a bit more about him. These concise eight lines seem straightforward-enough, until we take up those images: "the shore / ... of some hour" and "the forests / of the rumored month / between July and August." What does "the shore of some hour" look like, and how will we know when we've reached it? What of that "rumored month"? Who knows about it? Why is it replete with forests? How do you get there? And then there's the contrast of that "might be" with "must be" — the first so open to possibility, the other so determinedly conclusive. There is also the thought-provoking matter of the title, of its history and what it recalls to us about seeking and finding, and, ultimately, what we accept of what we see or what we think we know or have found. It's amazing how quickly complicated the reading of this poem can become when we strip it to its barest. This is a lovely, witty play of words. Richardson, who teaches beginning and advanced poetry workshops at Princeton, is the author of By the Numbers: Poems and Aphorisms (Copper Canyon Press, 2010), a National Book Award finalist that Publishers Weekly selected as "Book of the Year", and Interglacial: New and Selected Poems & Aphorisms (Ausable Press*, 2004), which offers some wonderful poems. Among his other collections are Vectors: Aphorisms and Ten-Second Essays (Ausable Press, 2001; available from Copper Canyon) and How Things Are (Carnegie-Mellon Press, 2000). 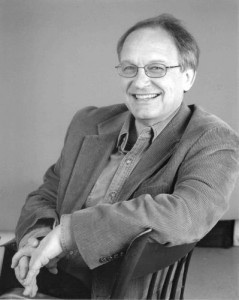 The recipient of numerous other awards and fellowships, Richardson has been published frequently in The New Yorker, as well as in the Paris Review, Narrative, Pleiades, Versedaily, Poetry Daily, and Slate, and in numerous anthologies, including Best American Poetry 2011. * Copper Canyon Press acquired Ausable Press in 2009. Ausable's titles remain in print under Copper Canyon's auspices. Some other poems by Richardson that can be found online are: "In Shakespeare" (this poem also appears here, at The Best American Poetry blog), "My Godzilla", "Subject, Verb, Object", "Postmortem Georgic", "End of Summer", "Still Life With Moving Figure" (audio of Richardson reading is poem also is available); "The Worst Team Money Could Buy"; "Northwest Passage"; "How to Read Music"; "Another End of the World" (audio also available); "The God Who"; "Evening Prayer"; "Spellbound"; "Shore Town, Winter"; "Epilogue in Snow". The Literary Review: James Richardso "Even More Aphorisms"
I offer this poem for The High Calling's Random Acts of Poetry, which this week is seeking poems about mothers, grandmothers, motherhood, or son- or daughter-hood for Mother's Day. The deadline for submissions is Friday, April 29. Go here for more information about posting your contribution to the T.S. Poetry Press page on FaceBook. Paul Smith (1921-2007), as his biography notes, was a remarkable person. Denied a formal education because of severe cerebral palsy, which also limited his ability to speak, Smith became an artist. . . with the help of a manual typewriter. Unable to use both hands at the same time, needing to use one to hold down the other as it pressed the typewriter keys, Smith created images based on several letters and an assortment of ASCII characters: @ # $ % ^ & * ( ) - . He's been called "The Father of ASCII Art" and also "ASCII Art's Grandfather". Refining techniques he developed over some 70 years, Smith made hundreds of typewriter pictures, each taking several months to create, all full of shadings, colors, textures. His subjects ranged from Americana, animal portraits, and seascapes, to trains, Christian art, portraits of American presidents, and World War II. Look at any of the artworks here; if you did not know otherwise, you might remark on the skillful use Smith made of his fine drawing pencils, pastels, or charcoal. Although Smith's originals remain largely in the hands of those to whom he presented his gifts, copies were maintained and have become Smith's gift to all of us. Other artists who use typewriters in their work, though without the challenges imposed by an incurable neurological disorder, include Keira Rathbone. 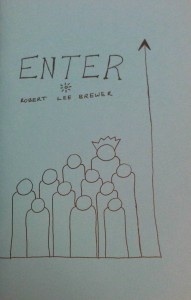 Robert Lee Brewer recently published a limited-edition chapbook, Enter. The collection's title is apt: What happens when we enter into relationships (as here we enter into the relationship of readers and poet) is the thematic thread that ties the poems together. It is the poet's relationships to those most important, if not always closest, to him — his father, his children, his loves (including his wife) — that are at the heart of the 21 poems that comprise the chapbook. The "father" figures especially in Brewer's work here and, by the poet's own admission, the relationship is "complicated". We get a first glimpse in the first poem, "Solving the world's problems", in which the son appears at odds with the father, who, midway through the poem, comes across as a kind of bogey-man: "Father turned into a dream filled / with fire and a horrible laugh. I / burned into a cloud of smoke." Absence is felt. Eventually, there's rupture — "Father became a phone call and then / silence." — until, ultimately, understanding, however uneasy, wins out: "I worried what I might // transform into next. I worried / what I might already be. Then, / I forgave father." Later, in the poem "Father's shoes"*, the portrait fills out with a tender detailing of the father's spark of recollections of his own father, the leavings again and again, the absences that, no matter how long or for what reason, end with the usual "Pretending / nothing was wrong, not / a damn thing missing. . . ." The last poem, "My Father", uses beautifully the metaphor of magnets to explain what is inexplicable: the bond of son to father and the son's received wisdom of needing to "try anything / they could to hold everyone together forever." There's a palpable sense of what's missing from the relationship(s) but feeling isn't allowed to get in the way of the telling. In "The world will worry for you", for example, we expect no varnishing when the poet says directly, "Forget speaking in code; forget / telling it slant; here is what happened:. . ." Or in "Of summer", where the poet again speaks directly, urging, "Place your mask on the counter / and write me a letter without the words / "Dear" or "Sincerely". . . ." The pain is complicating. 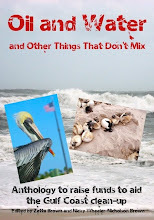 Other poems in the chapbook Brewer categorizes as "poems of the world", or "political statement poems"; they include "Watching the ice melt", "Cold water", and "One day we looked for the snow". That last poem especially conveys honestly a weariness, if not utter boredom, with the issues of our time, the end-stopped lines underscoring the ennui and lack of enthusiasm for doing anything about our problems: ". 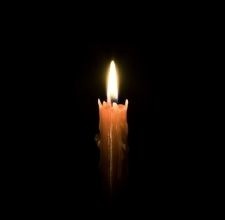 . . we mourned // the loss and watched / on our televisions, / the slow chaos unfolding / an inch at a time. / We watched; / we mourned; / we ate ice cream." It's all just too familiar. It was not until I read the 21 poems several times that I saw their degree of depth. Employing language that is largely unadorned, Brewer manages to do what all good poets do, what he himself maintains should be the primary purpose of poems: to communicate with the world. That world need comprise only a single reader who can "enter" into the conversation and get the meaning to render the effort successful. Brewer, poetry columnist for Writer's Digest and editor of the Writer's Digest's resources Poet's Market and Writer's Market, has published poems in Barn Owl Review, OCHO, MiPOesias, and other print and online literary magazines. He posts regularly at his popular Poetic Asides blog and at the My Name Is Not Bob blog. If you are interested in purchasing a copy of Brewer's chapbook, write to him directly at robertleebrewer[at]gmail[dot]com. * To read the poem "Father's shoes" from Enter, go here. 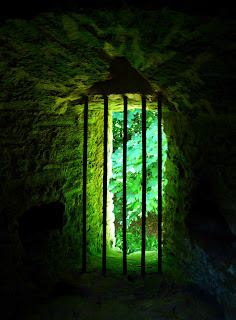 I offer this poem, in Shadorma form, for today's Picture Prompt Challenge at One Stop Poetry. Today's One Shoot Sunday feature is an interview with photographer Greg Laychak. Go here to read the interview and then scroll down for directions for participating in the poetry or flash fiction challenge. 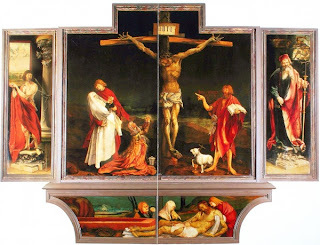 My other Easter poems: "Tenebrae" and "Paschal Candle", "What Lifts From Darkness", "Nard". * Quoted in the chapter "Life Touchstones" (p. 41) in The Art of Toshiko Takaezu: In the Language of Silence, Peter Held, Editor; The University of North Carolina Press, March 2011. This is a beautiful scholarly analysis of Takaezu's masterful ceramics. The monograph includes a foreword by the internationally known textile designer Jack Lenor Larsen, as well as essays by Paul J. Smith, director emeritus, American Craft Museum (now, Museum of Arts and Design), New York City. There are 164 color illustrations. Toshiko Takaezu died March 9, 2011. See the last item in Saturday Sharing for a video interview with this great artist and additional links. 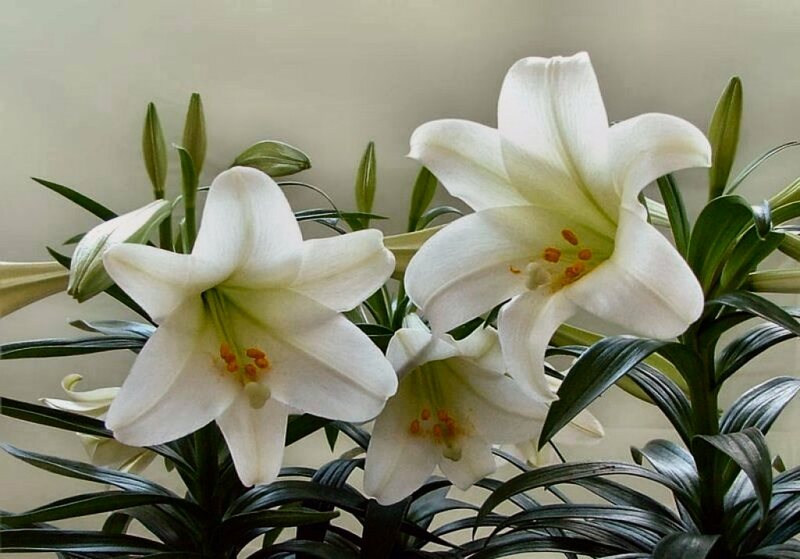 Other Easter poems: "What Lifts From Darkness" and "Nard". 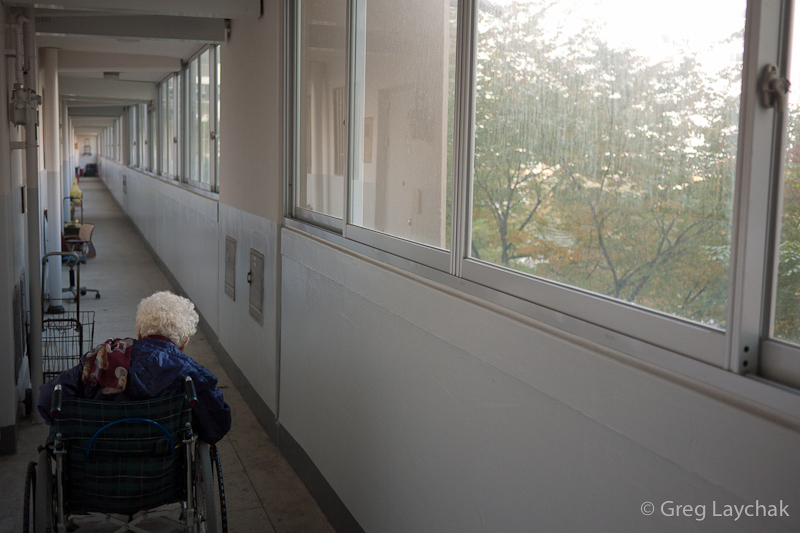 Have you ever thought of walking out of your job and walking on to something more meaningful? Today's edition of Saturday Sharing introduces you to two women, Margaret Wheatley and Deborah Frieze, who talked with people all over the world, starting in Mexico, and then documented in their new book how a change of beliefs about what can be done and how creates solutions to what before seemed insoluble. ✭ Ever wish for a suggestion box for the future of technology? Check out the Internet Wishlist, which describes itself as "a collection of ideas for apps and Websites [that] people are wishing for." (My thanks to On Being blog where I first saw this link.) To contribute your own wish, just post your own app- or Website-related idea on Twitter with the hashtag #theiwl; be warned, however, that only the most innovative and forward-looking ideas are shared. ✭ Broken Pencil, based in Toronto, Canada, is both a Website and a print magazine that publishes four times a year. It's devoted exclusively to "underground" culture and the independent arts. In addition to reviewing books, videos, and artworks from the indie marketplace, it reprints articles from the alternative press and also features original fiction, commentary, and interviews. ✭ Margaret Wheatley, whose book Perseverance I reviewed here, has published with Deborah Frieze a new book: Walk Out Walk On: A Learning Journey Into Communities Daring to Live the Future Now (Barrett-Koehler Publishers, April 2011). Wheatley and Frieze traveled to seven communities around the world, including Columbus, Ohio, and Johannesburg, South Africa, "to meet people who have walked out of limiting beliefs and assumptions and walked on to create healthy and resilient communities." What they learned they share in their book. The story behind the project and what it means to the authors, the people and places visited, and WOWO-related events across the country can be found here. Margaret Wheatley and Deborah Frieze from Deborah Frieze on Vimeo. ✭ Lost & Found: The CUNY Poetics Document Initiative features correspondence, journals, critical prose, and transcripts of lectures or other talks of New American Poets. This "extra poetic work" is uncovered in archival research, edited by scholars and students at The Graduate Center, and published as a series of chapbooks by the Center for the Humanities at The Graduate Center, CUNY. Series I, including selections from collected letters of Amiri Baraka and Edward Dorn, and the correspondence of Kenneth Koch and Frank O'Hara, was published in 2010; Series II will appear this spring and offer Robert Duncan's Olson Memorial Lecture #4 and selections from Muriel Rukeyser's Spanish Civil War archive. The chapbooks are available by subscription at various price levels (from $20 Student to $500 Sponsor, with the Basic just $25); go here for ordering information. Also see my poem "Nard", posted earlier this week. ✭ The Japanese artist Katsutoshi Yuasa (b. 1978), whose solo show "The Imaginary" is at the Corn Exchange Gallery in Edinburgh until May, is a talent to watch. His oil-based woodcuts with pigment on paper, based on his own digital photographs of urban environments (he edits and changes each image to monochrome, then "transfers" it, painstakingly and in great detail, onto plywood ready for hand-printing), are full of light and shadow and masterful. A graduate of Royal College of Art, London, Yuasa has held a number of international residencies, his most recent with Danish Art Workshops, Copenhagen; and his work was selected for inclusion in Paul Coldwell's Printmaking: A Contemporary Perspective (Black Dog Books, 2010). 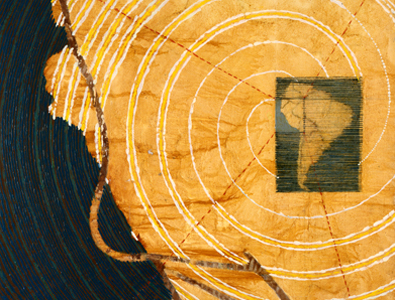 ✭ Digital media is showcased and preserved virtually at the Adobe Museum of Digital Media. It's an experience to take a tour of the "building" in the virtual dimension, listen to lectures and interviews, sign up for a membership, and interact with the curated exhibits. Currently showing: "Atoms + Bits = the neue Craft (ABC)", by John Maeda, president of Rhode Island School of Design. As the museum's description says, AMDM is open 365 days a year, 24 hours a day, and accessible anywhere. ✭ Cody Hooper of Texas started out with watercolors, focusing on realism, and then moved on to abstract painting. Reflecting the rich colors and strong light of the Southwest, his canvases evidence great skill with his brush. His "sculptured" art (seen toward the bottom of this page) are beautiful. He likes to experiment; see, for example his 2theCore (2009), which consists of three interchangeable 36"x30" panels. ✭ Angela Strassheim's "Evidence" is on view at Minneapolis Institute of Arts through October 9. The exhibit may not be for everyone. Strassheim worked in forensic (crime scene) photography, and her images in this show are of places where domestic, familial murders took place. She titles her color photographs of exteriors of houses with the names of the murder weapons used (she explains why in the video and excellent interview I note below); she made her interior black-and-white shots using a chemical reagent (BlueStar) that she sprayed in a mist onto walls to detect traces of DNA; she exposes what cannot be seen with the eye, and does so with chilling artistry. These photographs — of houses that might be anywhere in America (Strassheim traveled widely) — tell unsettling stories of their own. That people live in these houses today makes our impressions of the images even eerier. The exhibit is part of the New Pictures Series, which features experimental photography and new media art from around the world. The print edition of Ornament magazine is featuring Jill A. DeDominicis' article "Isabelle de Borchgrave: An Invitation to Dream", Vol. 34, No. 3. ✭ Washington, D.C.'s Kreeger Museum is presenting through July 30 "Tom Wesselmann Draws". Described as the "most comprehensive exhibition of drawings by the artist that has ever been assembled", the show numbers 108 works that span the years 1959 to 2004, when Wesselmann died. A catalogue accompanies the show. Wesselmann, like Andy Warhol, Roy Lichtenstein, James Rosenquist, and Robert Indiana, was a key figure of the Pop Art Movement. 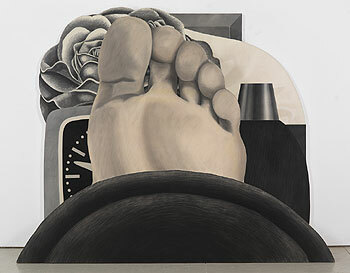 Image Above to Right: Tom Wesselmann, Drawing Version of Bedroom Painting #24, 1972; Charcoal on Gesso on Canvass, 75-1/4" x 39-1/4" x 19-5/8"
The following video (13.10 minutes) features Claire Wesselmann, the artist's wife and his model, in a walk-through with docents preparing for the exhibition. She talks about her husband's career, his techniques, process, and ideas, and the 1960s arts scene in New York City, which "lit him on fire", she says. 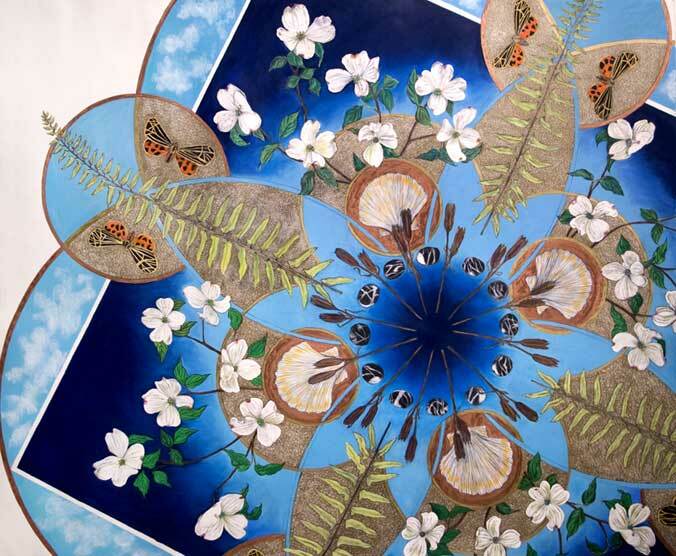 ✭ Six artists from Baltimore, Maryland, and six from Washington, D.C., are participating in "Corridor" at the Art Museum of the Americas (OAS) in Washington. The premise for the show was "to challenge the artist and curator relationship" by having one artist from one city select another artist from the other city to exhibit in an "artist choose artist" format. The curator from Baltimore worked with the artists from D.C., and the curator from D.C. worked with the artists from Baltimore. The show features sculpture, installations, prints, photography, and video. The show is up through June 26. The artists are: Oletha DeVane, John Ruppert, Joyce J. Scott (be sure to see her beadwork creations), Bernhard Hildebrandt, Brandon Morse, Phil Nesmith (he's a superb photographer), Michael Platt, Sofia Silva, Susana Raab, Soledad Salame, Martha Jackson-Jarvis, and Jeff Spaulding. ✭ The beautiful art of painter Kazaan Viveiros, whom I first profiled here, is showing in "Realism... believe" at ArtDC Gallery, Hyattsville, Maryland. Viveiros has four works, including "Dutch Tulip" (see image below), in the exhibit, which is curated by master trompe l'oeil painter Patrick Kirwin. A reception for the artists, who include Kirwin as well as Dennis Crayon, Heather McCaw, Vicki St. Germain, and Jack Labadie, several of whom are Kirwin's former students from the Alexandria, Virginia, Art League, is tomorrow night from 6:00 p.m. to 8:00 p.m. The show will be up until May 7. Acrylic on Panel, 30" x 15"
In honor of National Poetry Month, I'm offering a new edition (January 2011) of John O'Donohue's poems, Echoes of Memory, to the first person who can name the poets who are the subjects of the clues and the titles of the films about the poets. For question #4, please name each of the poets, because if you know one you will know the other. Only one of the films is not relatively recent. You must answer all the questions correctly and in order to win. 1. 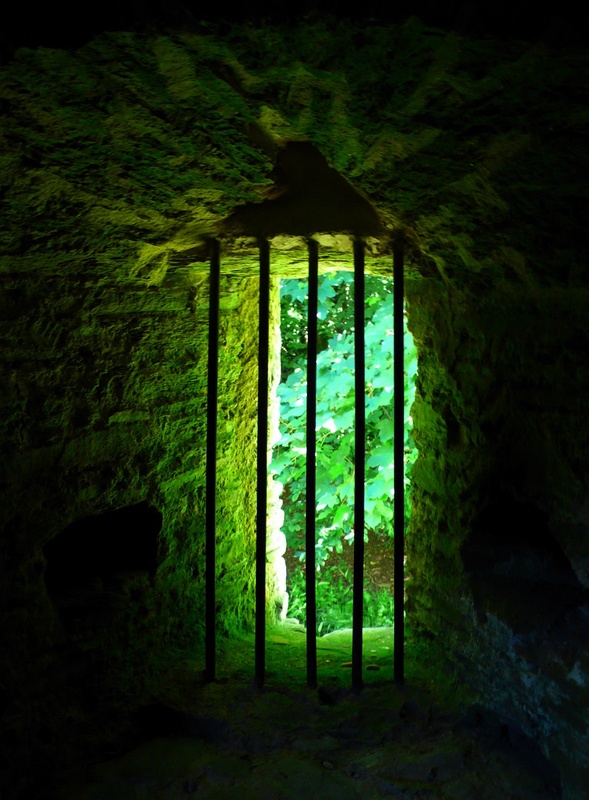 This poet's wife was misdiagnosed as insane and eventually committed to an asylum. He never divorced her. 2. This poet was an alcoholic whose wife became fast friends with his childhood sweetheart. He died in a New York City hospital. 3. She mourned this poet for six years after his death from tuberculosis. 4. Both poets, they met at a party, their attraction instantaneous. 5. The oldest of 12 children, she had by age 12 written her first epic poem: four books of rhyming couplets. 6. Many people have never read a word by this poet, though they "know" his name. He was a founding member of a major literary movement, a champion of civil rights, a photographer, a songwriter, a teacher. Please leave your answers, in the same order as the questions, in the comments section. The deadline is April 30. I'll announce the winner on Monday, May 2. Please be sure to spell out an e-mail address if you cannot be reached through your blog. TEMPT1 (his real name is Tony Quan) is a Los Angeles-based graffiti artist who has ALS (he was diagnosed in 2003). As is the experience of a friend of mine with ALS, TEMPT is paralyzed and, until recently, could only communicate one letter at a time, one blink of the eyes at a time, because his insurance would not pay for the kind of device that, for example, Stephen Hawkings, who also has ALS, uses to communicate. His mind, fully intact, is "locked in" the body he cannot move. He has not lost his talent for drawing, only the means to create his art. . . until Mick Ebeling, his friend, got inspired. Design and branding expert Mick Ebeling is the founder and CEO of New York- and Los Angeles-based The Ebeling Group, a creative think tank and international production company that represents leading design and directing collectives. (TEG's clients have included the Guggenheim in Bilbao, Spain, Sony Pictures, and Sundance Film Festival.) Ebeling is also the founder of The Not Impossible Foundation, which, formed on the fly and with money out of the group's own pockets, found a way for TEMPT1 to draw again. He and a team of programmers, hackers, inventors, and other artists created EyeWriter, a low-cost, design-it-yourself eye-tracking device that can be built using the team's free open-source code and locally obtained materials, including a pair of sun glasses from the drugstore. How Ebeling and his team came to be introduced to TEMPT1 and develop EyeWriter for him is the subject of today's video (it's just under 8 minutes in length). It's an inspiring story of how an "ordinary problem of an extraordinary person" finds a solution. TEMPT1's work, by the way, is included in "Art in the Streets", which opened April 17 in Los Angeles at the Museum of Contemporary Art. If you see something that isn't possible, make it possible. EyeWriter was named by Time magazine as one of The 50 Best Inventions of 2010. In May 2010, EyeWriter received the first Future Everything Award for innovation in art, society, technology. In March of the same year, the project won the Prix Ars Electronica - Winner Interactive Art _ Golden Nicas and Grant. The latter is one of the most prestigious awards for creativity in the field of digital media. Ai said, and he did. Lu Qing is Ai Weiwei's wife. Ai Weiwei's father, Ai Qing (1910-1996) was a poet who was imprisoned for six years and, while exiled for 20, was forced to clean public toilets. 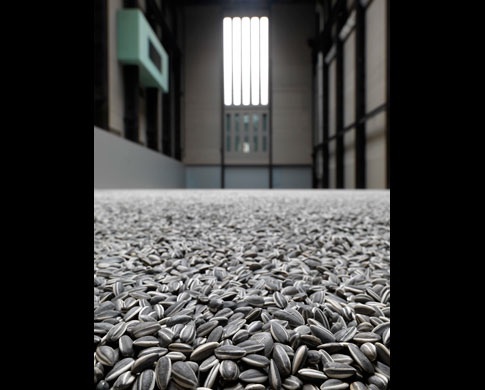 To learn more about Ai Weiwei's installation Sunflower Seeds at Tate Modern until May 2, go here. Take time to view this excellent video with Ai Weiwei, who demonstrates how the installation was made and what it means (you may also view the video here). The sunflower is deeply symbolic in China. My earlier post about Ai Weiwei is here. See Ben Davis, "Ai Weiwei Faces Strange New Accusations in China as Supporters Rally in Hong Kong: The Latest Developments", ArtInfo, April 11, 2011. Ai Weiwei is one of three artists who created site-specific installations for an exhibition, "The Divine Comedy", at Harvard. His installation ("Untitled", 2011) is a memorial to the schoolchildren who died in the 2008 earthquake in Sichuan; it consists of 5,335 school backpacks, each identical, each representing a child's life lost (unnecessarily, because school buildings were so poorly constructed, the result of graft and corruption), and a continuously looping sound piece, "Remembrance", in which each child's name is said aloud. A related project, "My Time Is Your Surroundings", organized by metaLAB (at) Harvard, calls for Twitter responses to the artist's work or continued detention. Every response using the hastag #mtys is projected live next to Ai Weiwei's installation, which is on view until May 17, 2011. Go here for more information about participating in @aiww One-to-Many with Ai Weiwei. I offer this series, in the Shadorma form (six lines in 3-5-3-3-7-5 syllables, respectively), for this week's One Shot Wednesday event at One Stop Poetry, which each week invites poets to share, read, and comment on each other's work. Be sure to visit the site late Tuesday afternoon and every Wednesday for links to the many contributors' poems. all profits to Red Cross We have the technology. quake survivors when they'd like to be rescued? 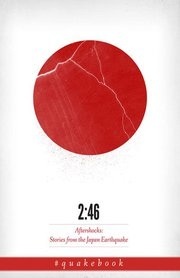 The just-launched e-book 2:46: Aftershocks: Stories from the Japan Earthquake, dubbed #QuakeBook after its Twitter hashtag, is Twitter-sourced, the result of a tweet by Our Man in Abiko (@ourmaninabiko), a British resident of Japan who felt helpless to help those caught up in the catastrophic earthquake and tsunami of March 11. What he did know how to do was edit and, after tweeting what he wanted to do — create a record of what happened and raise relief money for the Japanese Red Cross Society — he had several hundred editors, writers, designers, and translators volunteering their services to make a book of witness and testimony. One hundred percent of sales go to the JRCS. The book is available now for Amazon's Kindle and as a downloadable app for computer (Windows PC, Mac) or mobile device (iPhone, Blackberry). The contents of 2:46 (the title denotes the exact time of the earthquake), created in less than two weeks, comprise essays, artwork, and photographs submitted by 85 contributors from around the world. There's a piece from Yoko Ono, stories from journalists on location, work specifically created for the book by former Yomiuri Shinbun reporter Jake Adelstein, science fiction writer William Gibson, and novelist Barry Eisler (he wrote the Foreword), plus recollections from people in Japan who experienced first-hand the horrors of the quake and the tsunami that followed. I offer this poem, in the Shadorma form comprising six lines of 3-5-3-3-7-5 syllables, respectively, for today's One Shoot Sunday event at One Stop Poetry. You'll find here a selection of five photographs by James Rainsford and instructions for participating in the Picture Prompt Challenge. Poetry and flash fiction may be contributed. Another of my poems using the Shadorma form is here. For another One Stop feature with James Rainsford, go here. most pertinently put. Emphatically silent. us more than any, are never put in any other way.